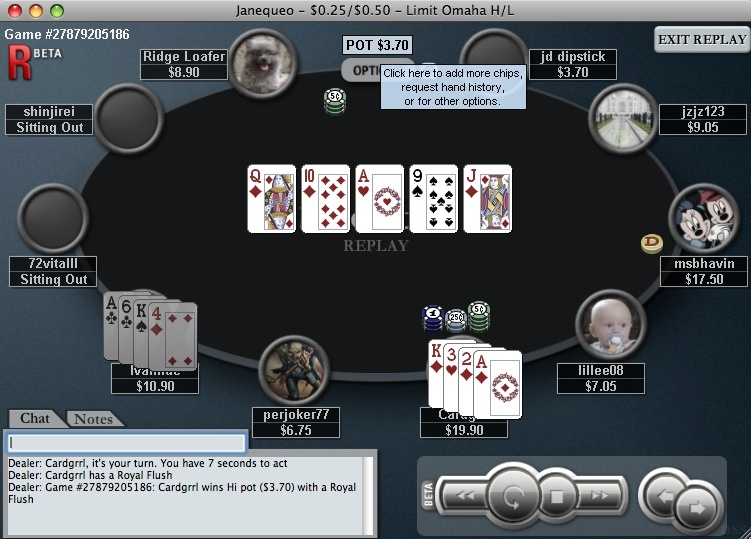 Congrats on your Royal Flush online. Good to read that you also have one in the real world. I have only managed one in my life and that was playing 7 card stud in a Reno casino 32 years ago. Seems like they are way more royal flushes online than the norm but thats a whole new topic or rant. Well, congrats, but it seems so wrong. Surely I have played many more hands than you have, but I've had just one online, zero live. SO unfair. @dbcooper: Sure there are way more Royals online than in brick & mortar play. That's because there are WAY MORE hands dealt online than in any live venue. At the moment, for example, Pokerstars has about 31,000 tables in play. THIRTY-ONE THOUSAND. That's a lot of hands being dealt simultaneously. I see more than twice as many hands per hour on each full ring cash table as I do in a casino. I'm also frequently multi-tabling. The usual probability of a Royal Flush is cited as approximately 1:649,740. Have I played a couple of million hands online? Yeah, at least. It's not especially surprising, then, that I've seen several Royal Flushes.